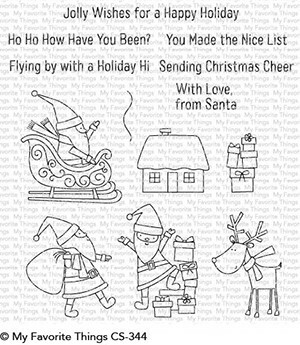 Stamps > My Favorite Things Clear Stamps "Here Comes Santa Claus"
A little bit jaunty and a lot bit jolly ? here comes Santa Claus and after a year of rest, he's ready for action! Choose from a sack-bearing Santa, present-piling Santa, or Santa-in flight and then complete the scene with accessory images like a stack of gifts and a cozy little elf hut. And we all know old St. Nick would be lost without his trusty reindeer so we've included one of those as well. Send some Christmas cheer with this charming collection. Clear stamp sets include the name of the set on the sticker for easy identification. Our clear stamps and Die-namics are made in the USA.